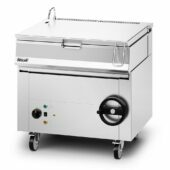 Each of the bratt pans from the Opus 800 series has an enormous capacity (80 litres), which is ideal for the frying of onions, slow meat braising, hot holding, and the making of stews and sauces to name a few. 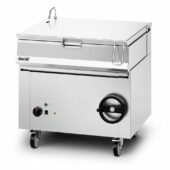 This capability is further complemented by a built-in ‘Simmer mode’, which reduces power by up to 50% when in use, and is the ideal way to ensure consistent cooking at a pace that suits you. A push button water fill tap allows you to quickly refill the unit, while a large pouring spout and lip reduce the risk of spillage — allowing for the quick emptying and cleaning of the equipment.